Omega-3 Pork® from Finnish family-owned farms will soon be sold to highly demanding Chinese consumers in packages portraying the Nordic Arctic and the magical northern lights. The new premium packages continue to build Finland’s rising image in Chinese markets. The Chinese people are interested in Finland. The purity of nature and the opportunity to see the northern lights are attracting an unprecedented number of Chinese travellers to Finland. According to Visit Finland, China accounted for the biggest increase in the number of overnight stays in Finland last year, by 33%. The rising trend in Finland’s image is also reflected by the fact that in January 2018 the Chinese magazine Travelling Scope ranked Finland as the top destination for winter travel. These elements valued by the Chinese will soon be available also on the shelves of local premium supermarkets and online through new retail grocery chains, where selected products of the Omega-3 Pork® innovation will be found in the upcoming weeks. “Exports to China have got off to a good start and we are excited about this significant step. HKScan is one of the first Finnish companies to operate in the premium category in the Chinese market,” says Jukka Nikkinen, head of HKScan exports. 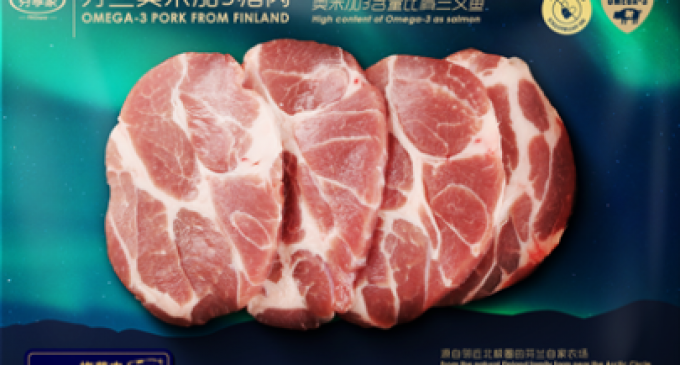 HKScan started exporting pork from Forssa, Finland to China in April 2018. During the first six months, meaty bones and feet, which are highly valued and important raw ingredients in Chinese cuisine, have been included in the container shipments to China. “Now we can start the customer presentations of the premium products selection and concept. Production will commence in Haiyan, China, in the upcoming weeks. The product selection consists of tasty and tender Omega-3 Pork® products that are high in omega-3 fatty acids,” Jukka Nikkinen says. The packages and products designed for the Chinese market clearly stand out from what is currently offered on the market and create an entirely new and significant opportunity to commercialize the Finnish food chain expertise in export markets. “We are proud to be bringing to Chinese consumers meat that is delicious, healthy and safe and produced with professional expertise at HKScan’s contracted family farms. Our exciting packaging will surely stand out on the shelf. It’ll be great to see in practice how we can create significant added value for the world-class work of Finnish producers of pork,” adds Jukka Nikkinen. HKScan’s aim is to ship roughly three million kilograms of pork to China during the first year and to triple that volume by 2020. Relative to the volume of pork currently produced, this means that at least five per cent of all Finnish-reared pigs would end up on Chinese dining tables through HKScan. HKScan launched pork exports to China from its Forssa production unit on 23 April, 2018. HKScan’s products will be targeted at the Chinese retail sector, industrial customers and the HoReCa sector. The targeted export volume for the first year is 3 000 tonnes of pork meat, with plans to triple that volume by 2020. HKScan currently exports meat to nearly 50 countries. This includes pork exported to numerous EU countries as well as to New Zealand and Japan. HKScan sources its Finnish meat raw material directly from its 3,400 pig, beef and poultry contract farmers.